How much power does the M6 really need? Over 700 hp according to G-Power. 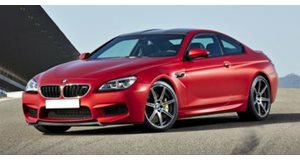 The BMW tuning maestros have upgraded its Bi-Tronik III power kit for the M6 unveiled back in March, boosting output from 560 hp and 501 lb-ft of torque to a supercar-beating 710 hp and 656 lb-ft of torque. This was a result of a modified ECU and a reworked exhaust system available with quad titanium or carbon 100 mm tailpipes. Performance now stands at a rapid 10.8 second standstill to 124 mph time and top speed of 187 mph. Chassis upgrades include 21-inch Hurricane forged alloys, height-adjustable coilover suspension, and uprated braking system. 17,985 Euros will get you the power boost, the wheels (and tires) comes in at 8,325 Euros, the suspension is priced at 2,179 Euros, while optional ceramic brakes come in at 14,460 Euros.